I am an Assistant Professor of Computer Science at the University of California, Irvine. 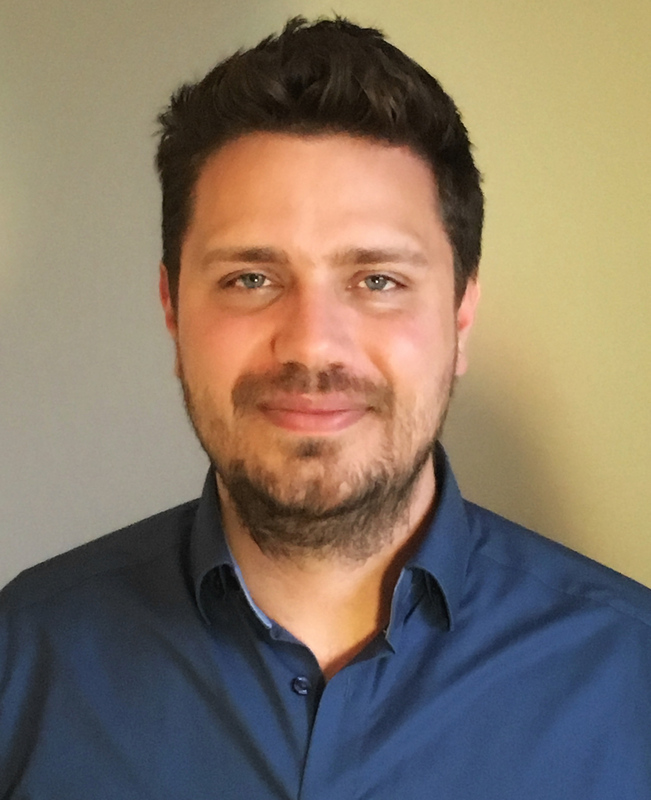 From 2016 until September 2018, I was a Senior Researcher and head of the statistical machine learning group at Disney Research, first in Pittsburgh and later in Los Angeles. I held previous positions as a postdoc with David Blei at Columbia University (2014-2016), and as a PCCM Postdoctoral Fellow at Princeton University (2012-2014). My Ph.D. advisor was Achim Rosch at the Institute for Theoretical Physics of the University of Cologne. I was a fellow of the German Academic Merit Foundation. I will serve as an Area Chair for ICML 2019 and NeurIPS 2019. I was invited to present at the workshop At the Crossroad of Physics and Machine Learning in Santa Barbara. Our workshop series on Approximate Bayesian Inference was offered as a Symposium this year, co-located with NeurIPS 2018. I joined the School of Information and Computer Sciences at the University of California, Irvine. Four accepted papers at ICML 2018. Accepted papers at AISTATS 2018, NIPS 2017, UAI 2017, ICML 2017 and CVPR 2017. Two journal papers accepted in 2017 (MLJ and JMLR). Accepted papers at AISTATS 2016, ICML 2016, and NIPS 2016. My primary goal is to develop a new generation of machine learning models by drawing on deep learning, probabilistic graphical models, and approximate Bayesian inference. My research, thus, tries to synthesize representation learning and probabilistic modeling. This results in new flexible and oftentimes interpretable models for unsupervised or semi-supervised learning on large data. My group has developed several such models for various applications, in particular for sequential data. 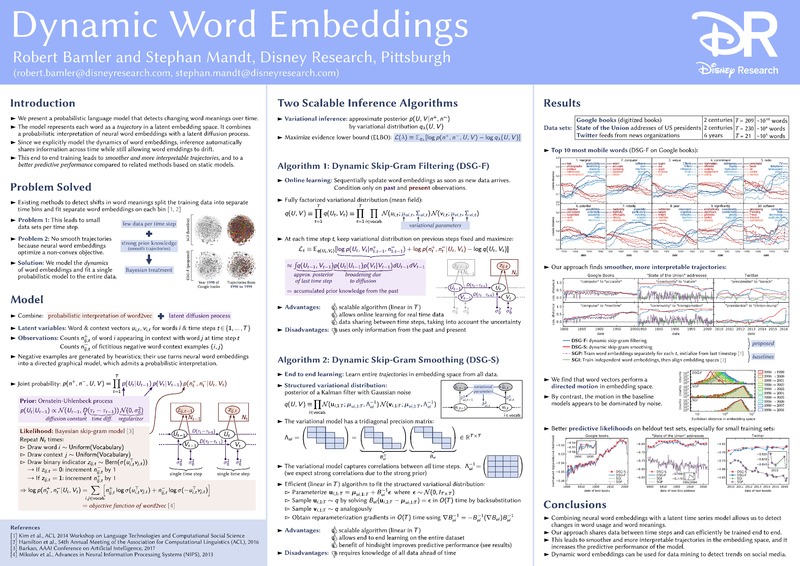 Dynamic Word Embeddings (ICML'17) combine word embeddings with probabilistic Kalman filters, allowing us to accurately measure how words change their meanings over hundreds of years while keeping track of uncertainty due to data sparsity. Factorized Variational Autoencoders (CVPR'17) helped us discover latent factors in audience face reactions to movie screenings. Disentangled Sequential Autoencoders (ICML'18) enabled us to generate artificial videos while gaining partial control over content and dynamics. My second goal is to design new learning and inference algorithms which are scalable and generic. I frequently use a methodology termed variational inference, an approximation scheme that allows generative models to be trained on massive scales. Relevant papers in this line of research are Stochastic Gradient Descent as Approximate Bayesian Inference (JMLR'17), Variational Tempering (AISTATS'16), Quasi-Monte Carlo Variational Inference (ICML'18), Iterative Amortized Inference (ICML'18), and Perturbative Black Box Variational Inference (NIPS'17). We also recently published a review article on this topic. I am interested in a wide range of applications, including computer vision, natural language processing, media analytics, and applications in the sciences. International Conference on Robotics and Automation (ICRA 2019), to appear. International Conference on Learning Representations (Workshop Track). S. Mandt, F. Wenzel, S. Nakajima, C. Lippert, and M. Kloft. Comment on "Consistent thermostatistics forbids negative absolute temperatures"
Popular article on negative temperatures in the monthly proceedings of the German Physical Society. Los Angeles, CA. April 2017. Mountain View, CA. April 2016. San Francisco, CA. June 2015. Mountain View, CA. June 2015. Machine Learning with Interdependent and Non-identically Distributed Data. Machine Learning Seminar, Berlin, Germany. February 2015. Machine Learning Seminar, Vancouver, Canada. January 2015. Physical Sciences Seminar, Yorktown Heights, USA. October 2014. (QUANTMAT 2014), New York, USA. April 2014. Theoretical Physics Seminar, Dunedin, New Zealand. February 2013. Princeton University, Princeton, USA. March 2012. (FINESS 2011), Heidelberg, Germany - September 2011. Theoretical Physics Seminar, Boulder, CO. September 2010. Theoretical Physics Seminar, Palaiseau, France. March 2010.